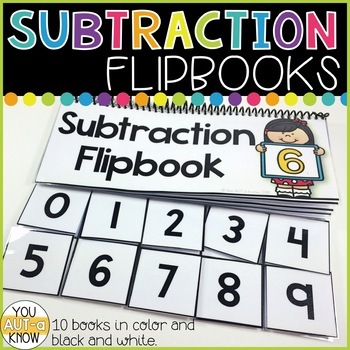 Included in this download are 10 subtraction flip books in Color and Black and White for subtraction facts within 10. 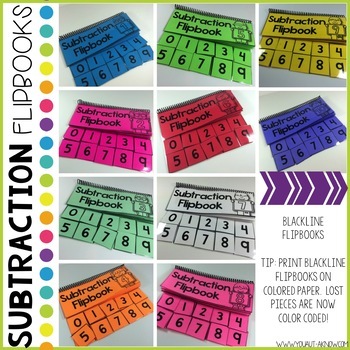 These flip books are great for classroom practice of subtraction skills. I love to use them in my classroom independent work stations! Each book contains 10 pages. That's 100 subtraction problems to practice in your classroom! 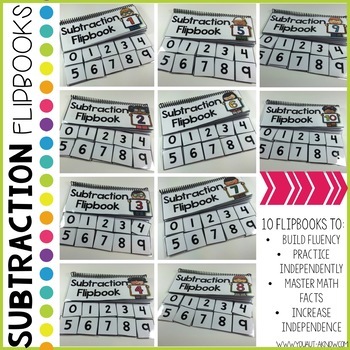 Subtraction Mega Pack for Special Education. Discrete Trial Lessons for Subtraction Facts 0-10. Discrete Trial Lessons for Addition Facts 0-9. •	Please go to your My Purchases page (you may need to login). Beside each purchase you'll see a Provide Feedback button. Simply click it and you will be taken to a page where you can give a quick rating and leave a short comment for the product. Each time you give feedback, TPT gives you feedback credits that you use to lower the cost of your future purchases. I value your feedback greatly as it helps me determine which products are most valuable for your classroom so I can create more for you. •	Look for the green star next to my store logo and click it to become a follower. Voila! You will now receive email updates about this store.